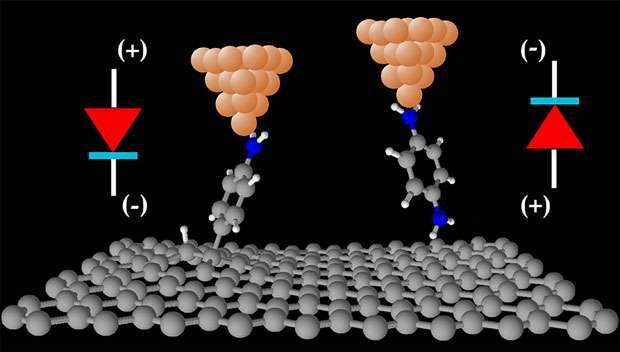 An international team of researchers led by the National Physical Laboratory (NPL) and the University of Bern has revealed a new way to tune the functionality of next-generation molecular electronic devices using graphene. The results could be exploited to develop smaller, higher-performance devices for use in a range of applications including molecular sensing, flexible electronics, and energy conversion and storage, as well as robust measurement setups for resistance standards. The field of nanoscale molecular electronics aims to exploit individual molecules as the building blocks for electronic devices, to improve functionality and enable developers to achieve an unprecedented level of device miniaturization and control. The main obstacle hindering progress in this field is the absence of stable contacts between the molecules and metals used that can both operate at room temperature and provide reproducible results. Graphene possesses not only excellent mechanical stability, but also exceptionally high electronic and thermal conductive properties, making the emerging 2-D material very attractive for a range of possible applications in molecular electronics. A team of experimentalists from the University of Bern and theoreticians from NPL (UK) and the University of the Basque Country (UPV/EHU, Spain), with the help of collaborators from Chuo University (Japan), have demonstrated the stability of multi-layer graphene-based molecular electronic devices down to the single molecule limit. The findings, reported in the journal Science Advances, represent a major step change in the development of graphene-based molecular electronics, with the reproducible properties of covalent contacts between molecules and graphene (even at room temperature) overcoming the limitations of current state-of-the-art technologies based on coinage metals. Adsorption of specific molecules on graphene-based electronic devices allows device functionality to be tuned, mainly by modifying its electrical resistance. However, it is difficult to relate overall device properties to the properties of the individual molecules adsorbed, since averaged quantities cannot identify possibly large variations across the graphene's surface. Dr Alexander Rudnev and Dr Veerabhadrarao Kaliginedi, from the Department of Chemistry and Biochemistry at the University of Bern, performed measurements of the electric current flowing though single molecules attached to graphite or multi-layered graphene electrodes using a unique low-noise experimental technique, which allowed them to resolve these molecule-to-molecule variations. Guided by the theoretical calculations of Dr Ivan Rungger (NPL) and Dr Andrea Droghetti (UPV/EHU), they demonstrated that variations on the graphite surface are very small and that the nature of the chemical contact of a molecule to the top graphene layer dictates the functionality of single-molecule electronic devices. "We find that by carefully designing the chemical contact of molecules to graphene-based materials, we can tune their functionality," said Dr Rungger. "Our single-molecule diodes showed that the rectification direction of electric current can be indeed switched by changing the nature of chemical contact of each molecule," added Dr Rudnev. "We are confident that our findings represent a significant step towards the practical exploitation of molecular electronic devices, and we expect a significant change in the research field direction following our path of room-temperature stable chemical bonding," summarised Dr Kaliginedi. The findings will also help researchers working in electro-catalysis and energy conversion research design graphene/molecule interfaces in their experimental systems to improve the efficiency of the catalyst or device.